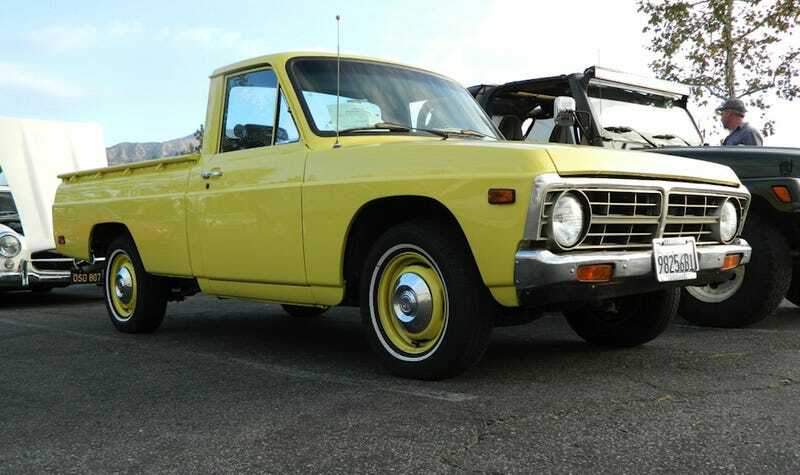 For $6,500, Do You Think This 1974 Ford Courier Will Deliver? Today's Nice Price or Crack Pipe candidate is a little different. It's not from Craigslist or eBay, or even that weird KiJiJi. Instead, it's a little Ford that I found at my local Cars & Coffee last Saturday. Let's see if this Courier is worth going to the show. If you were to consider the opposite ends of the automotive coolness spectrum, you would most likely find Lotus populating one side - the cool end - and Kia holding down the fort at the other, far-less cool end. That's just the way things work out. What however would happen if you were to create some sort of unholy matrimony of these two incompatible brands? Well, it's been tried, and yesterday's example - a 1998 Kia Vigato - came away with an 88% Crack Pipe loss, owing to it being far to pricy for being a Kia, no matter how much of a lotus position it attempted. Yesterday's ride was pretty pretentious. I mean, it was for a car company whose bread and butter has long been building cars for people who think Hyundais are too fancy. In contrast, today's Ford is about as unpretentious a vehicle as you could ever want to find. I just so happened to find this 1974 Ford Courier for sale at my neighborhood Cars & Coffee. Now, people generally gather at this sunrise event to share their cars, some car-conversation, and to enjoy an invigorating cup of joe from the Starbucks at the end of the parking lot. A few as well come to show off the cars that they have for sale. No one is obnoxious about it, and in fact this particular little pickup was parked near the back, out of the limelight. The '70s were the heyday of the mini-truck, as prices for gas climbed and its availably plummeted. Toyota and Datsun pretty much led the pack, while both Chevy, with its Isuzu-sourced LUV, and Ford, tapping Mazda for the Courier, chose the wait and see approach to the genre's staying power. This one seems to have perseverance. It's described as being all-original, and at first glance that appears to be the case. The drivetrain is all Mazda, comprised of a sensible 74-bhp SOHC 1.8-litre four and 4-speed manual gearbox. There's nothing fancy about it, and this one only has 114,000 on that hardware. Aesthetically, the truck is in pretty nice shape as well, and includes its original plain-jane wheels, dressed up a bit with some whitewall tires. There's no bumper in the back, which may make the truck a little less useful, but it absence does enhance the looks. The body has some minor nicks and dings here and there, but nothing serious, and there's no rust apparent anywhere. On to the interior, and that's where things get a little less original. From the factory, the Courier, in base form, came with a bench seat molded with a central divot to allow for the shifter to reach second and fourth. Here, that bench has been replaced by a set of funky-looking semi-buckets, with integral seat belt mounts and individual cup holders. I've seen these someplace before, but can't quite place them. They don't look bad at all, and in fact neither does the rest of the cabin. Their mystery origin bothers me, however. Perhaps you'll know. The window sign notes that the truck is fun to drive and, being a '74, falls outside of even California's strict emissions testing requirements. It also says that the asking price for this basic and old-school set of wheels is $6,500. That's fully $3,500 above what the truck intro'd for when new. Of course three-grand in 1974 dollars is about fifteen-large today, so perhaps it's a bargain. What do you think about this Courier for $6,500? Is that a price that should have someone carrying it off soon? Or, is this a car meet seller that should have just stayed at home?